Develop an annual report that will do the heavy lifting for ‘sales’ to increasing fundraising efforts to both corporate, foundations, Board, current and prospective supporters. 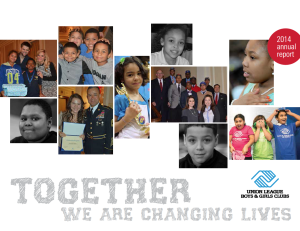 Update an outdated annual report with a new visually appealing that punctuates the impact of the Union League Boys & Girls Clubs established in 1919 in an easy to read and follow report. Present a new approach that will garner attention from target audiences including the affiliated private club and its members. Challenge – Tight Deadline. We had 8 weeks to produce a final printed and digital version annual report beginning with fresh concept, design, copywriting, photo selection, editing through production and delivery. CarusoPR took a quick pulse of the client’s target audiences and analyzed prior annual reports identifying a fresh approach to meet desired goals on an extremely tight timeline. We turned the annual report around – literally – developing a fresh, fun, colorful 24 page landscape design piece aligned with existing branding elements. The new design incorporated space for significant facts, updates and images that would be presented in an easy-to-read and understand format for the desired audiences. 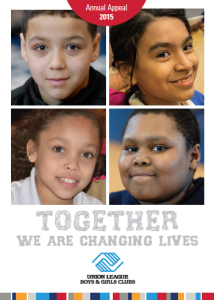 We worked closely with client to identify the key donors, honorees, and programs to be highlighted in the annual report. Due to limited timeline and budget, we scoured the client’s image library and selected the best impactful images of Club youth and key supporters for use in the piece. Our process included a careful audit of previous annual reports, understanding of target audiences, identification of client’s key issues to be addressed and likes and dislikes on style. To efficiently manage flow of information, we developed a specific page by page content map identifying themes, topics, main stories, sub-stories and images for each page. We wrote the copy working with client on edits to keep piece with objectives. We developed complementary pieces including the annual appeal, content for the private club members magazine (a key target audience) and a branded location map to carry the theme throughout the year.